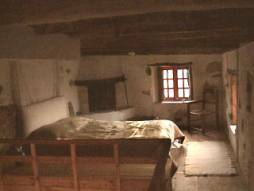 The second bedroom, with its own fireplace (left). On the second level, above the kitchen is the main bedroom with its own large balcony in the front. There is a double queen-sized bed, with mosquito net, and a small sink. Above the bathroom and part of the living room, there is a second bedroom, also with a double bed and mosquito net, and it's own fireplace. Note: Mosquito nets are only necessary in the summer. The house is equipped with a solar water-heater, so there's hot water practically around the clock, all year long, but there also is an electric water boiler for those most rare of times when the sunshine is sparse. There is a washing machine for clothes and so on, in the bathroom, as well as an iron and ironing board. There is a telephone, at which you may receive calls. It is not a luxurious house, but it is cosy and picturesque. Bed linen, bath towels, tea towels and tablecloths are provided, as well as laundry service for household linens only. Cleaning service can also be provided, upon request. Another corner of the living room –notice the rock, against which the house is built (above). 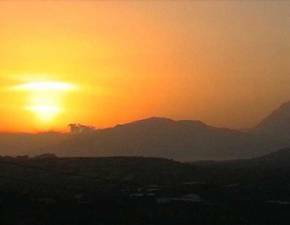 About the area and the village of Kousses: Messara is a rather large plain in central southern Crete, prefecture of Heraklion, and known locally as "Crete's sun-porch": this will give you an idea of the climate here, where even winters are milder than in the rest of the island. 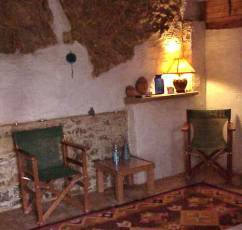 If you follow the road on the map, between Mires and Matala, you will find Kousses (just off Petrokefali). The village is a very quiet one, rather apart from the tourist frenzy, which is the norm, especially during the summer. Kousses is built on the north-facing slope of a large hill. The house is directly above the village church, one of the village's last houses, and one of the highest situated. Because it is north-facing, built directly on rock, the house is rather cool in the summer, when temperatures can reach as much as 46 degrees Celsius, if there's a heat wave. 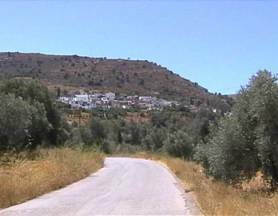 On the road from Petrokefali to Kousses (above) and view of the Idi Mountains, directly opposite the house, to the North (below). Also, because it is so high up on the hill, it offers a wonderful bird's-eye view of the entire wider area: The sea, the Messara plain, the Idi Mountains, opposite, and all the way to the Lassithi Plateau to the East, on a clear day. The Messara Gulf coast, 10km long, is very near, varying from 6km to 10km distance from the house (that means a 10-15 minute drive by car). The village is a very quiet one, rather apart from the tourist frenzy, which is the norm, especially during the summer. The village is a very quiet one, rather apart from the tourist frenzy, which is the norm, especially during the summer. The village is a very quiet one, rather apart from the tourist frenzy, which is the norm, especially during the summer. 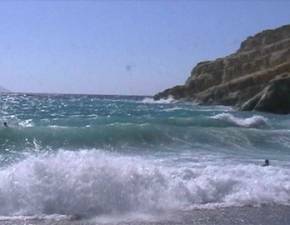 The best beaches are probably at Komos (wonderful sandy beach, "wild" nature, some nudism from spot to spot) and Matala (a more touristic spot, but the beach is much tamer and offers easier access to young children). Other things worth seeing in the area, are: the Minoan palaces at Phaistos and Aghia Triada, the antiquities at Gortys, the caves at Matala, the lake at Zaros, the Aghiofarango Gorge, the Museum of Cretan Ethnology in Vori and the weekly street-markets in Timbaki and in Mires. Matala beach, on a rather unusually windy day (left).